Yancy's Get A Grip Program - Yancy Camp - Fitness for Everyone! This is the special price for Current Yancy Camp Members! The sport of Obstacle Course Racing (OCR) requires the most well-rounded and complete fitness of any sport. We run…fast, far, up, down and through everything. We climb, lift, carry, pull, push, jump, and crawl…and, we hang. Obstacle racers need to be able to do many things well, but one of our most in-demand skills is also one of our least well-developed: Grip and Pull Strength and Grip and Pull Endurance. Obstacle failure is disheartening and performance crushing, and the majority of failures happen on grip/pull obstacles. Fortunately, there is a solution for 100% of racers that is straightforward and easy to incorporate into every training plan! The Yancy Camp OCR Training Program you know and love covers everything a beginning, intermediate, and elite racer needs to improve…programming for run endurance, speed and inclines, total body strength, agility, flexibility, and of course, grip strength! And man have we seen some incredible gains for our athletes across the board! Some of the most impressive gains our members have seen is in grip strength, and the ability to complete grip-intensive obstacles. Members have loved our focus on grip and we’ve gotten A LOT of requests from non-members for stand-alone grip & pull strength training that could be paired with any running and strength program. That’s why we’ve taken the very best of our grip training and created GET A GRIP! What is GET A GRIP! GET A GRIP! is a specialized, stand-alone training program that focuses on grip and pull strength and grip and pull endurance. You will have access to 3 workouts each week that zero-in on skills that will help you move across monkey and swinging bars, complex rigs (rings, ropes, straps, balls, polls, bars, etc. ), climb and traverse ropes and walls, carry and pull heavy objects, and in general, grip with more power for longer. • Online access to 3 OCR specific grip & pull strength and grip & pull strength endurance workouts each week. • Benchmark online testing program where you will complete grip/pull strength/endurance tests and log results for tracking and comparison with future testing. • Access to online video library where exercises can be viewed. • Access to the closed Facebook Group – “Yancy Camp OCR Athletes & Coaches” where a wealth of knowledge is shared between members and coaches on all things OCR on a daily basis. • Unlimited access to Coach Yancy for questions and answers. Who is GET A GRIP! for? Current Yancy Camp OCR Program Members. If you are currently a Yancy Camp member, your weekly workouts are designed with more than adequate grip & pull strength training. However, if you’re looking for additional grip training and a special focus in this area, you can add GET A GRIP! to your Program for only $5/month. Non-Yancy Camp OCR Program Members. If you don’t already have an OCR training program and want to see what it’s like to be a part of Yancy Camp without joining as a full member (and developing an incredible grip), this is for you. If you are following another OCR or run training program, but want the kind of iron grip that Yancy Camp coaches and members are known for, this is for you! 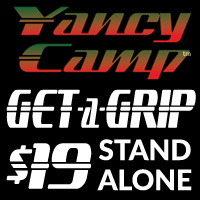 • Current Yancy Camp OCR Program members can add GET A GRIP! for just $5 a month. • Non-Yancy Camp OCR Program members can GET A GRIP! for only $19 a month. You may have a running program that you are happy with but are missing a dialed-in grip & pull strength component. Or, you may be working on grip, but are looking for a structured, professionally designed, proven program to help you either enjoy courses more with fewer obstacle failures, climb the age group ranks, or even find a spot on the podium. Whatever your OCR goals, the Yancy Camp GET A GRIP! Program will help you dramatically improve your grip & pull strength and take your racing to the next level!